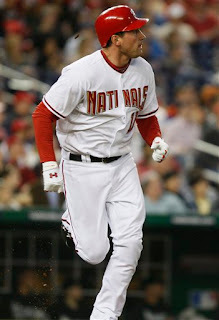 Up until there were only two outs remaining in this affair, tonight's game between Our Washington Nationals and The Florida Marlins had that feeling of a satisfying win. At least until Florida's Cody Ross deposited a two strike, one out off-speed pitch from Joel Hanrahan just over the left field wall in the top of the 9th inning this Friday. 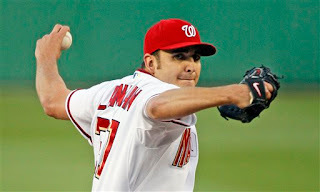 A deflating turnaround which made you feel for Washington's Starter John Lannan. Pitching into the 7th inning, Lannan was on top of his game this evening. On display was the John Lannan of 2008 every fan had come to know--in control, throwing strikes--getting batters out. In fact, Lannan was perfect through 3.1 innings, had struck out five of his last six batters faced when he offered up his only real mistake of the night--a fastball delivered to Florida's John Baker--which was drilled over the right field wall into the second tier of the pavilion seats--Section 236. Another Marlins Home Run that put Washington behind early 1-0, but not for long. As has been the case most of this young season, DC's hitters quickly mounted a comeback and Lannan had something to do with that as well. After Jesus Flores singled and Alberto Gonzalez had scored him on a double with one out in the bottom of the 4th, Lannan worked The Marlins Starter Ricky Nolasco for a terrific 10-pitch At-Bat. A subsequent ground out to shortstop that tired Nolasco, just enough to allow Anderson Hernandez to sharply stroke a single to left scoring Alberto with the go ahead run. A Washington 2-1 lead which they maintained for four more innings. Only to see Joel Hanrahan falter with one out in the top of the 9th. A blown save that would find many on hand quickly turning their eyre towards Home Plate Umpire Tim Timmons when this game went to an extra frame. Earlier, Timmons had ejected Our Manager Manny Acta at the end of the bottom of the 3rd for arguing a called strike out of Elijah Dukes. Now--with Saul Rivera on the mound in the 10th, two outs and Jorge Cantu on first base via a single--nearly everyone watching felt Rivera had struck out Dan Uggla to end the frame. Rivera thought he's K'd Uggla, so did Flores. Each took steps toward Washington's Dugout. Uggla, frozen over Rivera's wicked slider delivered--thought so too. Everyone seemingly except Home Plate Umpire Timmons who called ball three. A decision that angered the home crowd, baffled Our Washington Nationals and stunned Rivera. Shocked by the aribiter's decision, Saul lost control and proceeded to give up a crucial two out single to Uggla as a result. A now tougher 1st & 3rd situation at hand that got worse when Jeremy Hermida followed with a slow rolling grounder deep into the hole that Alberto Gonzalez made every effort to hustle over, pick up and throw out Hermida at first. Only to see Jeremy beat the throw while Cantu beat his was home with what would become the eventual winning run. All night long Our Washington Nationals played a close, hard fought game. And just when you expected a solid victory, that 2nd Curly "W" In The Books was taken away. Elijah Dukes would unload on a Matt Lindstrom fastball in the bottom of the 10th for what looked like a sure Home Run to left--only to see the baseball get stuck in the green outfield wall for a double. The leadoff man on base but stranded when the very hard throwing Lindstrom (clocking up to 98MPH on the radar gun) retired Josh Willingham on a fly ball and then proceeded to strikeout both Flores & Gonzalez to end this game. Final Score from Nationals Park where The Florida Marlins finished strong while Our Washington Nationals faltered down the stretch--Fish 3, Washington 2. John Lannan really deserved better--his first victory of 2009, but it was not to be. Strange game, with a very odd last two innings played. Despite the loss this game perfectly sums up baseball. You just never know how the game is going to turn out--until the final outs are recorded. Lannan would finish his 6.1 innings of work with 8 strikeouts, allowing just three hits and one walk. Really, Our Number 31 pitched a very fine game. Julian Tavarez and Mike Hinckley finished off the 7th frame for Lannan. Joe Beimel pitched another solid 8th inning. Hanrahan's blown save in the 9th proved costly--as did Rivera's allowing of the game winning run in the 10th. Although, you could argue Saul had a legitimate beef with Home Plate Umpire Tim Timmons. No one can say Washington didn't have their chances, 12 hits total including two apiece from Nick Johnson and Ryan Zimmerman. And Alberto Gonzalez, who has been nothing short of excellent both in the field and at the plate since he came over from The New York Yankees last summer--slapped out three more hits, knocking in one run and scoring another. Now batting .500 in the early season. Having never seen Gonzalez play before he donned a DC Uniform, I can't see what The Yankees missed by giving him up--other the fact that Derek Jeter played in front of him in The Bronx. He's really a good player. Talented, which Ryan Zimmerman has always been. With the rumors of a possible contract extension in the works, Zimmerman has been stepping up his game too, but what he needs to work on is his inability at times to make the routine toss across the diamond to first base. Again tonight The Z-Man had too much time to toss out Jorge Cantu on a grounder hit his way in the 6th. Looking at the ball before throwing--Ryan threw the ball away. Nick Johnson couldn't make a play to stop it. Later, in the 9th, Zimmerman would nearly do the same thing on a grounder hit by Cameron Maybin. But Johnson saved Zimmerman from his 4th error of 2009 by picking the ball out of the dirt for the final out of the frame. With Dukes on second base with his leadoff double in the bottom of the 10th and one out--Jesus Flores took a called 3rd Strike on a Lindstrom fastball right down the middle of the plate. Surely, Matt's high velocity is intimidating, but Jesus needs to get his bat off his shoulders for that pitch. With the game on the line, you better be swinging. Lindstrom was throwing nothing but heat and Jesus Flores never swung his bat during six pitches--not even once. Speaking of Maybin--in the bottom of the 1st inning--The Marlins' Centerfielder laid out rushing to his right for a slicing liner off the bat of Zimmerman. A dive that Cameron stretched out all the way across the grass, running in for The Defensive Play of This Game. The very talented and young Maybin made a very nice play. When Manny Acta got ejected from the game for arguing balls and strikes with Timmons, it became the second time he's been ejected while Manager of Our Washington Nationals. 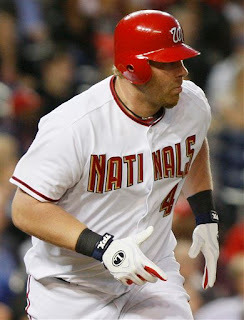 Sohna and I didn't noticed the misspelled "NATINALS" jerseys worn by Adam Dunn and Zimmerman tonight until we got home from the game and saw pictures. It's pretty funny, but how can you miss that? 19.026 was the announced crowd on hand at Nationals Park, quite a few of whom seemed to be Marlin Fans--which was sort of surprising. I didn't realize their fan base travelled so well. And immediately after the game, Washington announced Cristian Guzman was being placed on the 15-Day Disabled list. His hamstring injury not healing as quickly as originally thought. The team expected to recall and place Alex Cintron on the 40-Man Roster as his replacement. Finally--Tom won tonight's Presidents Race in the 4th inning. We watched the game on MASN, and the pitch to Uggla was well off the plate. Perhaps there was inconsistency in how the ump was calling those pitches, but it was not really in the vicinity. Tough one...but I think we'll have to get used to this as Hanrahan either grows in the role or blows up. I'm done. Until the Nationals put a professional product on the field, and that includes firing Manny Acta and removing Hanrahan as closer, I resign as a fan. I'll be putting my tickets up for sale on stub hub and won't be back at Nats Park except to see real major league teams like Toronto and Boston. Good luck selling those tickets. If you do manage to find buyers, you won't be getting face value for them. I don't care if I get face value for them. I just want to get rid of them. This is not a major league team. They are a 100+ loss joke and I'm tired of it!